The fourth chapter of “The Railman Throughout Dayton History” details an unusual occurrence in Dayton – and world – history. Although some might not believe it, the book claims it to be true. Many have heard about the rumored aliens housed at Hangar 18 at Wright-Patterson Air Force Base, but here is the real story. According to our textbook, the aliens were searching for a legendary Railman sandwich. From lightyears away, they used their intergalactic smell-o-tron to pick up hints of freshly-cooked pastrami and freshly-salted french fries. In a historical agreement, the aliens traded a trip to Dayton, OH and a Railman sandwich for intergalactic peace with the humans. The peace agreement signed right here in Dayton remains hanging on our wall at The Deli to this day. 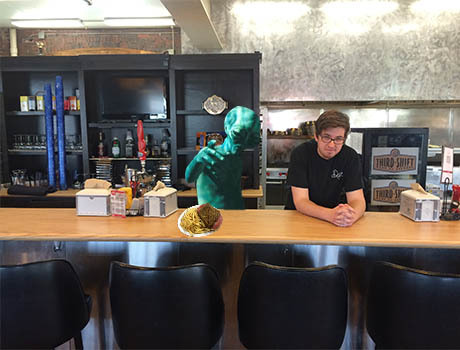 We even had one of the aliens stop by recently to enjoy a Railman and although our buddy Brian was intimidated at first, he agreed to take a picture! In honor of the Railman and intergalactic peace treaties, we are serving the Railman with French fries and a fountain drink for $9.99 today! Soups today will be Italian Wedding, Cream of Mushroom, and Chicken & Wild Rice along with Chili, Chicken Noodle, and Lobster Bisque!